Leg swelling is not an uncommon occurrence in life, particularly in adults. In many instances, it is temporary and passes without treatment. Leg swelling may arise with walking or standing for long periods beyond what a person is accustomed to, and also occurs more frequently in a person who is overweight or leads a sedentary lifestyle. This may also apply to the elderly who are frail and immobilized. Although it is is often not caused by any diseases in these situations and passes shortly thereafter, there are times when leg swelling needs to be taken as a very serious sign. Leg swelling that is persistent or recurrent for no apparent reason or swelling of the legs in the elderly may be a sign of an underlying disorder. Some of these conditions, particularly in the elderly, are very serious and potentially fatal. There are several reasons for swelling of the legs but in most instances, it is due to fluid accumulation in the legs. Sometimes excess fluid pools within the tissue spaces (edema) while at other times it may be accumulated within the blood vessels. Fluid normally flows in and out of the tissue spaces and blood vessels in order for nutrients, oxygen, carbon dioxide or wastes. The body has several efficient mechanisms to ensure that fluid does not accumulate in any part of the body. The legs are the most prone to swelling because the return of fluid to the heart is against gravity. Therefore any problem in terms of excess fluid within the body, reduced heart function, problems with the blood vessels and related dysfunction will lead to fluid accumulating in the legs first before arising in other parts of the body. Leg swelling is, therefore, a sign of an underlying problem in one or more of these systems. Venous insufficiency where the leg veins are compromised and the blood from the legs cannot return to the heart efficiently. It is due to conditions like varicose veins where the valves in the veins are inadequate and the veins bulge. Deep vein thrombosis (DVT) is one of the serious conditions that can arise in the elderly – if the clot in the leg dislodges, it can block the artery in the lungs which can be fatal. Heart failure where the heart cannot pump blood effectively which also compromises the return of blood to the heart. Kidney problems where the kidney’s ability to regulate the water levels in the body are affected thereby causing the retention of fluid in the body. Fractures of the leg bone which is more commonly in the elderly with age-related decrease in bone density and diseases that cause brittle bones like osteoporosis. Sometimes if there is damage to the nerves in the leg like with long-term diabetes mellitus and there may be no severe pain despite a fracture. Joint swelling particularly in the toe, ankle or knee joints due to conditions such as rheumatoid arthritis, gout, and osteoarthritis which are also more frequently seen in the elderly. Medication for conditions such as high blood pressure (hypertension) and diabetes mellitus. These conditions are also more common in the elderly and require lifelong medication. Swelling may arise as a side effect. Gout: a form of inflammatory arthritis that develops in some people who have high levels of uric acid in the blood. The build-up of uric acid could result in sudden, severe attacks of pain, redness, and tenderness in joints especially near the base of the big toe. Sprained Ankle: an injury which occurs when the ankle is rolled, twisted or turned in an abnormal manner that results in tearing or stretching of the ligaments. 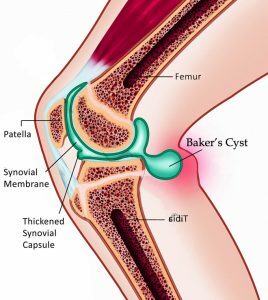 Popliteal Cyst (Baker’s Cyst): a prominent swelling at the back of the knee. It is usually caused by an underlying injury or condition in the knee joint. 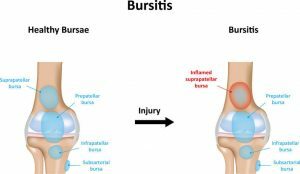 Knee (Prepatellar) Bursitis: an inflammation of the bursa in your knee. Although these are not the only conditions that cause leg swelling, it is among the more common and important causes of a swollen leg in an elderly person. A further diagnostic investigation is necessary to conclusively identify the cause. Do Light Exercise: Exercise can help improve your circulation and reduce the chance of fluid accumulation. Swimming or floating float in water can be especially effective as the pressure from the water can help promote circulation, and floating gives your circulatory system a relief from gravity’s constant pull. Raise Your Feet (ideally above your heart): This counters the effect of gravity on blood circulation. Hydration: Excess salt is a major cause of the swelling. If you increase your fluid intake, it can help dilute salt content in your body. Diet Adjustment: Consider increase intakes of anti-inflammation food like strawberries, blueberries, cherries, and oranges, olive, nuts, fatty fish like salmon, mackerel, tuna, and sardines. Take an Epsom Salt Bath: Epsom salt, named for a bitter saline spring at Epsom in Surrey, England, is not actually salt but a naturally occurring pure mineral compound of magnesium and sulfate. The theory is that when you soak in an Epsom salt bath, these get into your body through your skin. A gout is a painful form of arthritis that occurs when high levels of uric acid in the blood cause crystals to form and accumulate in and around a joint. Alcohol. Beer and distilled liquors are associated with an increased risk of gout and recurring attacks. Moderate consumption of wine doesn’t appear to increase the risk of gout attacks. Avoid alcohol during gout attacks, and limit alcohol, especially beer, between attacks.